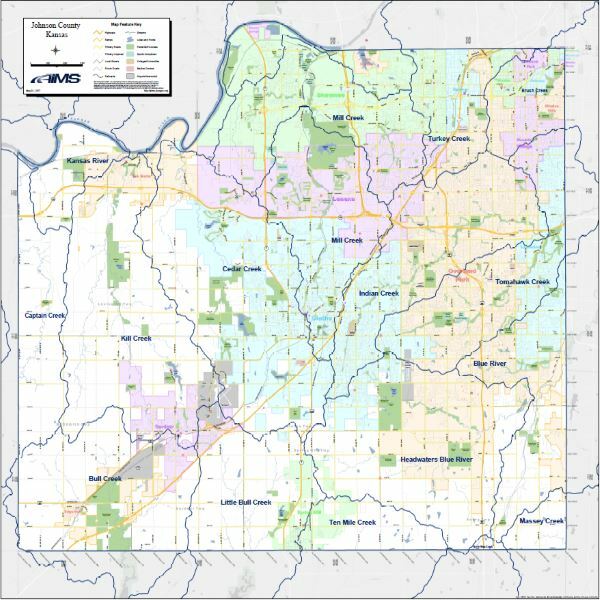 AIMS can print various county-wide wall maps in full color. 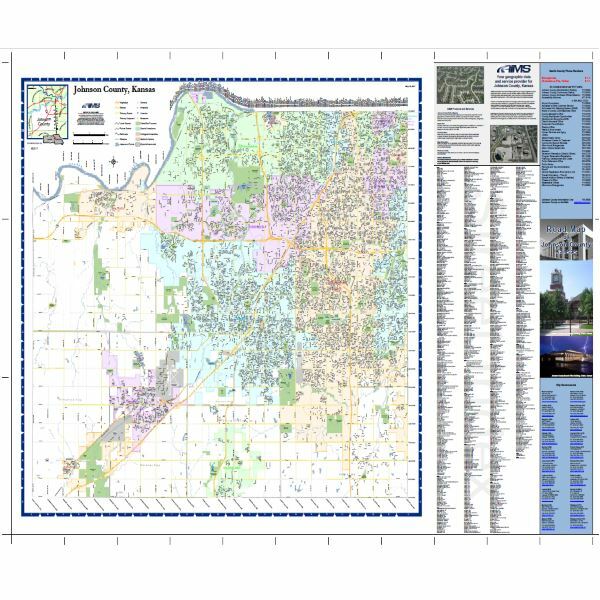 All printed wall maps below are 36" x 36" and cost $25 each (with the exception of the foldable Jo Co Street Map which is $5). Additional printed copies of each map are $5. 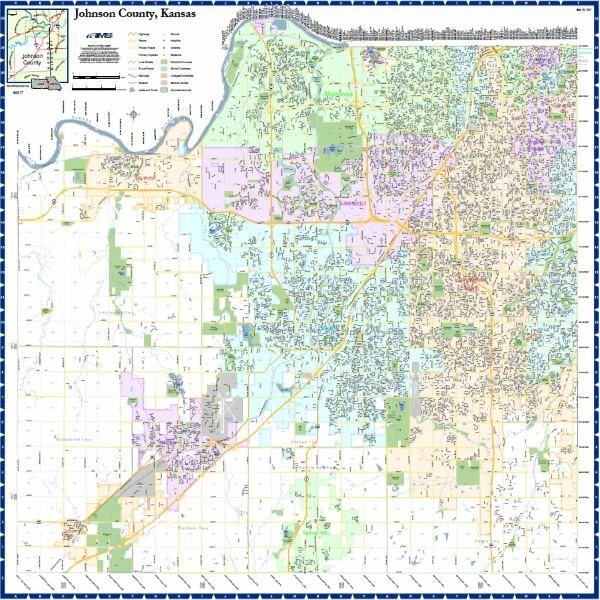 The Jo Co Base Map is also available at 50" x 47" (3000 scale) and 60" x 56" (2400 scale) ($60). Pdf form of the wall maps below can be downloaded by clicking each of the map thumbnails. These maps can also be used as a background for your own data! Contact the Mapper of the Day for details. The County Road Map is intended to highlight the county's street network. The map includes all county streets including 'future' roads that are yet to be built. Other features include a 100-block grid along the top border for address range identification, a bingo boundary to assist in locating streets, color-shaded city boundaries, and several noteworthy landmarks, among them airports, schools, parks, golf courses, hospitals, and college campuses. Upon request, this map can be produced with the addition of any of our area-based datasets. Updated nightly. The County Base Map is the foundation for many of the maps which AIMS creates. Although similar to the County Road Map, there are several features that make this map unique. This map does not contain a street or 100-block index. Instead, it displays a light gray background image for the areas surrounding Johnson County. It also removes several of the point datasets, such as schools and libraries, that are available in the County Road Map. Section-Township-Range information is also included in the County Base Map. Like the County Road Map, additional area-based datasets can be added upon request. 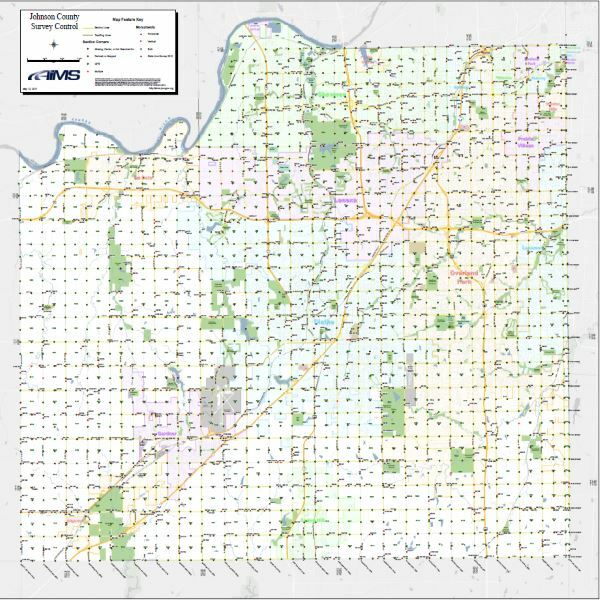 Uniquely, the County Base Map is available in three sizes: 36"x34" (1:4,000 scale) - 50"x47" (1:3,000) - 60"x56" (1:2,400). Updated nightly. Jo Co Street Map with street names index. Updated nightly with current data and foldable when printed. 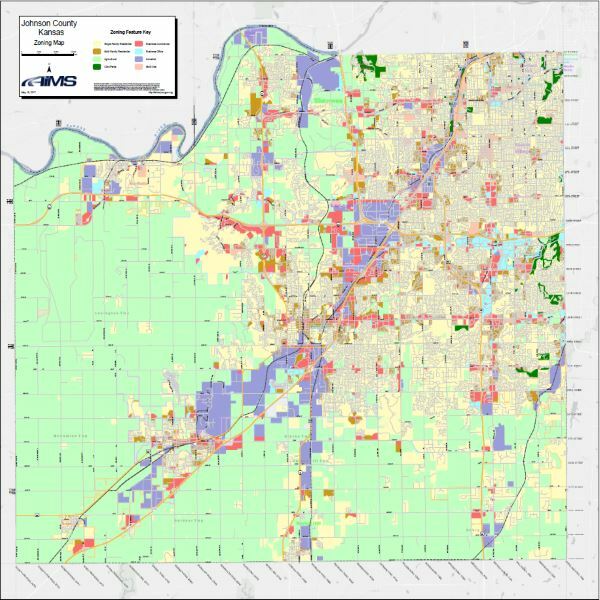 The Landuse Map displays the land use for all 230,000+ properties in Johnson County. Detailed land use descriptions are assigned by the Johnson County Appraiser. These detailed descriptions are then narrowed down to 15 'generalized' categories, determined by AIMS, for better visual display. Updated nightly. 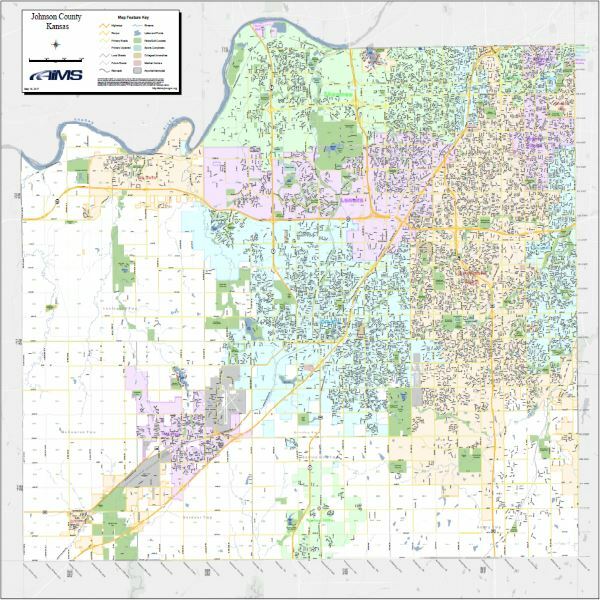 The Zoning Map displays current zoning for all areas of Johnson County. Zoning is determined by each individual city, as well as Johnson County Planning for unincorporated areas. As with the Landuse Map, AIMS narrows down the numerous zoning categories to 8 'generalized' categores for better visual display. We also offer a lookup table of each city's zoning codes and descriptions. Updated nightly. Built specifically for surveyors and engineers, the Survey Map consists of relevant survey control datasets such as Section Corners, Monuments, and Section-Township-Range information. Section Corners are symbolized based upon their GPS status. Monuments are labeled by name (E.g. 'BM 500'), and are symbolized by their type (Horizontal, Vertical, or Both). This map also includes points from a 2012 survey of the Kansas-Missouri state line. Streets, city boundaries, and some landmarks are included for reference. Updated weekly. Link to a .pdf copy of the Johnson County Zipcode map. 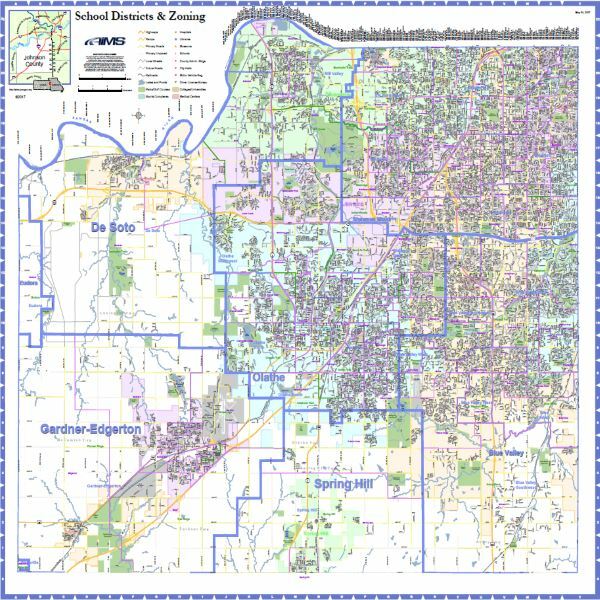 The Schools Map displays the seven school district boundaries of Johnson County as well as school locations and the current school zoning boundaries of each school. Streets and some landmarks are included for reference. The Commissioner Districts Map represents the six commissioner districts in Johnson County. Streets and some landmarks are included for reference. This map is updated monthly with current data. 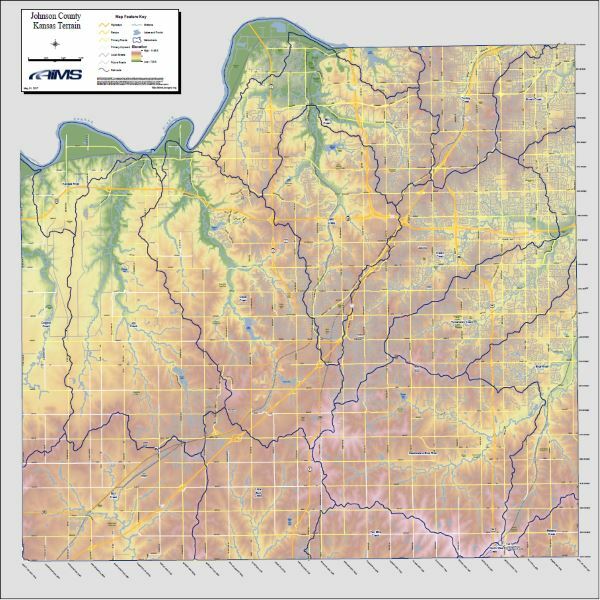 The Terrain Map displays elevation in Johnson County using a Digital Terrain Model (DTM). The DTM was derived from LiDar captured in December 2011. Also included are the county high point, lakes and streams, and watershed boundaries (labeled by stream name). Streets and some landmarks are included for reference. 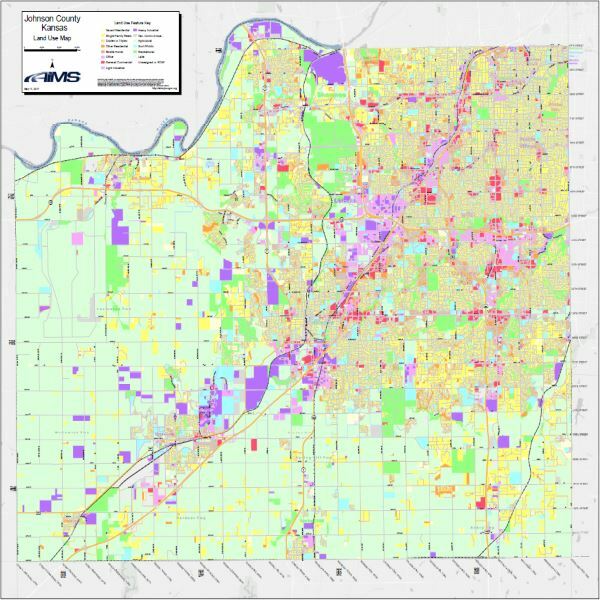 Link to a .pdf copy of the Johnson County Watersheds map. 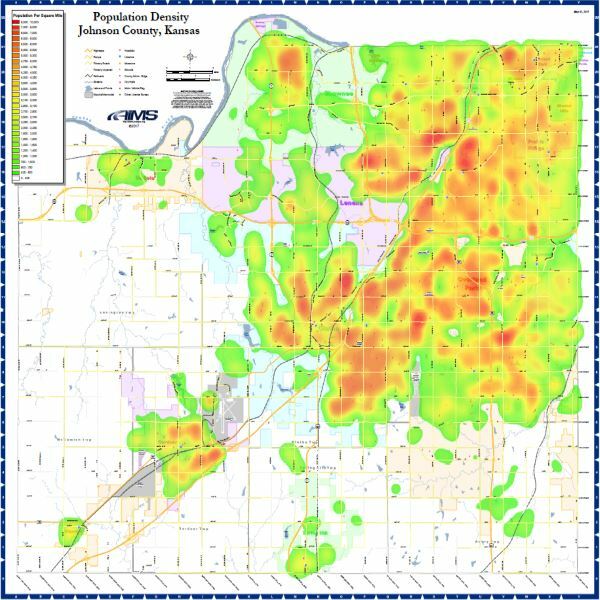 The Population Density Map displays population concentrations in Johnson County. The darker red areas represent highest population densities in the county. This map is updated monthly.